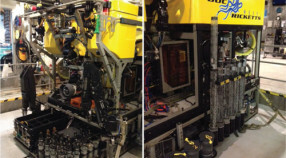 Today’s ROV dive at Guide Seamount, which is a little over 100 kilometers (63 miles) due west of Davenport, California, was quite exciting and much different than the dives conducted at Axial Seamount. 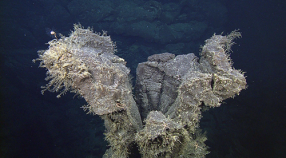 In comparison to Axial and its inhospitable fresh lava surfaces, Guide is a very old seamount, having last erupted some 16 million years ago. Where Axial is a volcano with a summit caldera on an active mid-ocean ridge, Guide formed over an abandoned ridge when tension on the tectonic plate caused continued, very slow spreading. 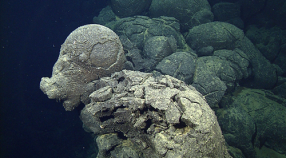 Decompression melting in the old magma chamber generated small eruptions over millions of years. 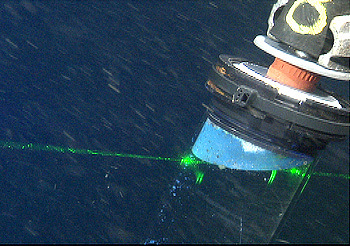 Guide is one of several seamounts off California that formed in this way, as is Davidson Seamount, which is 80 kilometers off the coast of Big Sur, California, and a part of the Monterey Bay National Marine Sanctuary. Both seamounts comprise a series of parallel ridges, but Guide is smaller and has a deeper summit than Davidson. 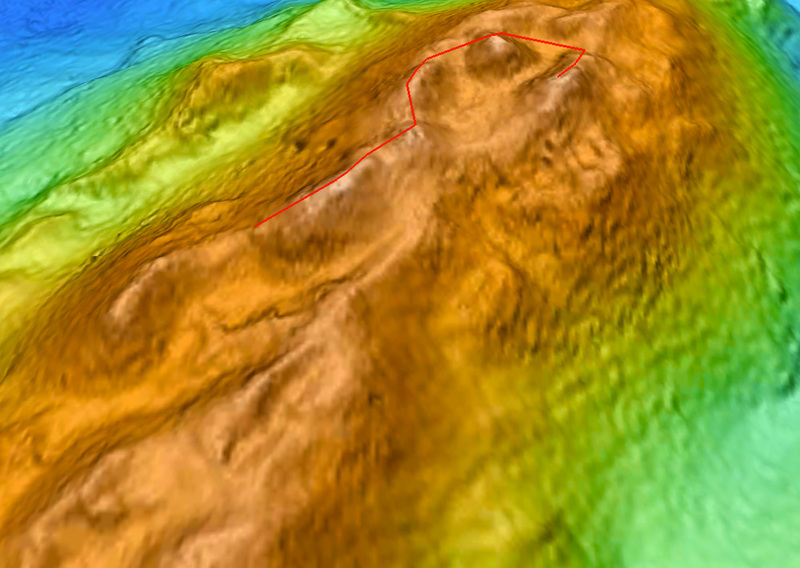 An oblique view of the bathymetric map showing Guide Seamount and today’s planned ROV dive track (in red). 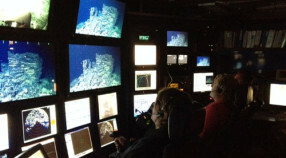 The dive began at 1,760 meters depth and the highest point was 1,672 meters. 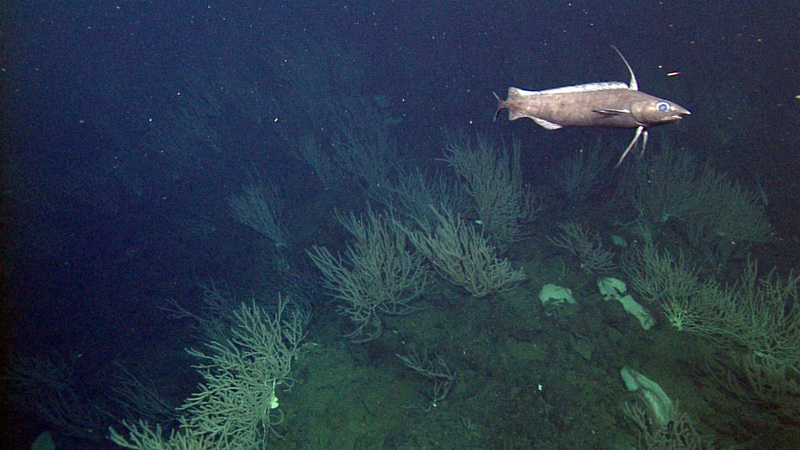 We last surveyed Guide Seamount in 1999 and at that time we only sampled the deeper flanks below 1,800 meters, and the mission objective was a geological effort to collect rocks for the purpose of dating the seamount. Today’s survey, however, was a biological survey of the summit cones between 1,680 to 1,750 meters, and it was truly exploring as no one has ever been to this location before. We saw many of the same species that we’ve seen at other seamounts along the coast of California, but what really stood out were the sheer number of bamboo corals (genus Keratoisis) that we saw. The bamboo corals are a family of corals that primarily inhabit deep water. They are very long lived and, likely, slow growing. The bamboo corals we encountered today are probably 100-200 years old, like those found at Davidson Seamount to the south. A codling, Antimora microlepis, swims above the dense thickets of bamboo corals (Keratoisis sp.) that were observed at Guide Seamount. We surveyed nearly 3.5 kilometers of seabed today and saw dense thickets of Keratoisis almost continuously; we likely saw many thousands of these corals and it was as if we were exploring a deep-sea, old-growth forest. We saw other octocorals as well, such as two species of Paragorgia, Clavularia sp., Heteropolypus ritteri and a primnoid, Calyptrophora sp. ; however, these were seen in very low abundance. We also frequently encountered a small black coral (Umbellapathes) that, at first glance, looks very much like a stalked crinoid. We observed sponges of several different species, including the cloud sponge, Farrea sp., and the trumpet sponge, Chonelasma sp. 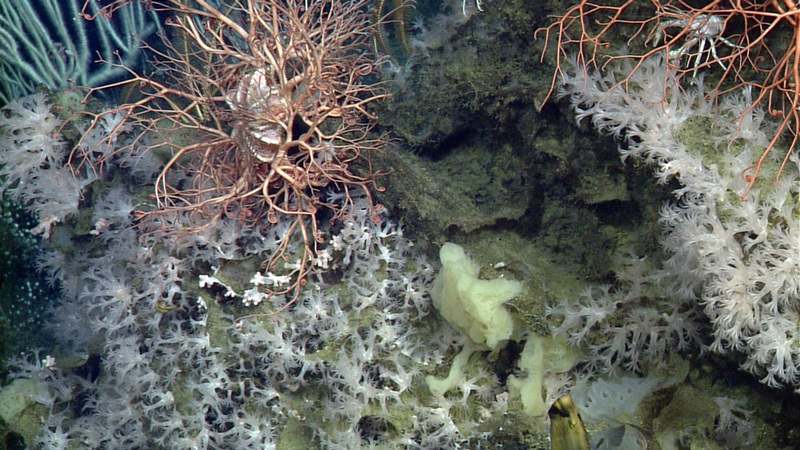 These large sponges covered wide swaths of seabed and, along with the larger corals, are considered habitat-forming animals because they provide complicated structure on the seabed that creates habitat for a variety of small (worms, crustaceans, anemones, etc.) and juvenile (fish, crabs) organisms. A beautiful scene showing the diversity of marine life encountered at Guide Seamount today. In this image we see a large colony of the octocoral Clavularia sp., along with several sponges, two basket stars (Gorgonocephalus sp.) and a squat lobster (Galatheidae). 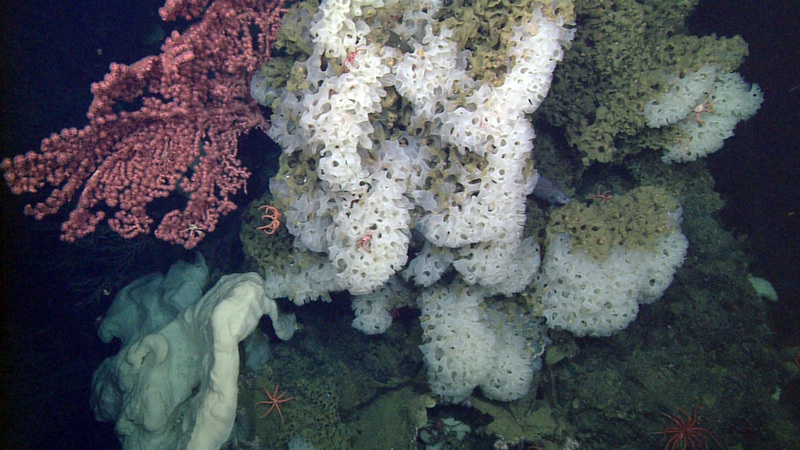 Some of the large, habitat-forming corals and sponges encountered today including cloud sponges (Farrea sp. ), trumpet sponges (Chonelasma sp. ), and bubblegum coral (Paragorgia arborea). We also saw a variety of fishes, including an abundant population of rattails (Macrouridae), codlings (Antimora microlepis), and snailfish (Liparidae). Near the end of the dive we were treated to a large and beautifully colored nudibranch which none of us had ever seen and is likely new to science. This was a very busy and productive day and quite a finale as the conclusion of this expedition.